First things first. I understand that you are eager to get started, but if you are not able to download JReviews from the Client Area, please don't despair. This process should be automated and you should have instant access to downloads. However, sometimes glitches do occur which require manual intervention. Please be confident that we will get this resolved. Just let us know by submitting a ticket and we'll respond as quickly as possible. We are an established business and have been developing JReviews for 10 years so even if you don't hear from us right away, know that we will get back to you for sure. If you purchased any Add-ons with JReviews you won't find downloads for them. First install JReviews on your site and after that you install the Add-ons directly from the JReviews administration using the Remote Install & Updates link in the sidebar. Our site is up 24/7, but we are not. Typically you'll get a response from us within a few hours or less during our work schedule, but we can only guarantee a reply within 24 working hours. We are located on both Atlantic and Central European Time Zones from Monday through Friday, except for holidays, and you'll find that we sometimes reply on weekends as well. However, that's not a guarantee because we also need time off to relax and to spend with our families so we can recharge and continue doing great work for you. Typically during the summer and winter periods we'll lower the number of hours dedicated to support because we are taking some time off. You can check the announcements board in our forum and we recommend that you subscribe to that board to get this type of notifications. You can reach us using the JReviews Forum and also through our private Help Desk. Use the forum for general questions about setup and for things that you believe won't require access to the site. Use the ticket system when something isn't working correctly so we can check the issue on your site. To speed up the time it takes to resolve an issue always provide the links to pages that we need to check. If you are submitting a ticket provide admin access so we can also check your setup. We have a whole Documentation site available and tons of valuable information throughout the site. Not all of the documentation for WordPress is up to date, but at least 95% of what we have out there is valid for both Joomla and WordPress and the differences are made up in the Quick Intro and Setup Guide and Video Tutorial mentioned below. You can also count on us to answer any question or doubts you may have about installing or setting up JReviews on either platform. Make sure your server meets the minimum installation requirements. Read the JReviews Quick Intro & Setup Guide for Joomla and JReviews Quick Intro & Setup Guide for WordPress. The WordPress version also includes a quick setup video at the end. Equivalent videos for Joomla can be found in the Video Tutorials mentioned in point 3. Follow the Online Documentation starting with the Planning & Organizing your JReviews setup, Installation & Upgrading and Setup JReviews. Check the Video Tutorials. You don't need to view all of them, but can pick and choose the ones you need. These were prepared using Joomla, but the whole JReviews interface remains the same in WordPress so you can utilize most of what's there; and we are here for you if you run into any problems during the setup process. Last, but not least. The Demo Sites are a great place to look for answers. If you see anything on our demo sites that interests you or you have a question about how something was setup you can log in as admin to check the setup. Show me the credentials and admin links for the demos. While we will do our very best to provide support for any installation, setup or functionality issues. I want to take this opportunity to remind you that customizations in general are not part of support. It would not be possible for us to sustain our business if we dedicated the time required to reply to every customization question. For this reason I invite you to post any customization requirement in the Freelance Board in the forum where one of the active freelancers with JReviews experience should be able to help you. Now it's probably a good time to start familiarizing yourself with JReviews, the terminology we use and learning how everything fits together. Begin testing your ideas through an initial setup so you can learn by doing and remember that you can check the demo to see how everything was setup there. 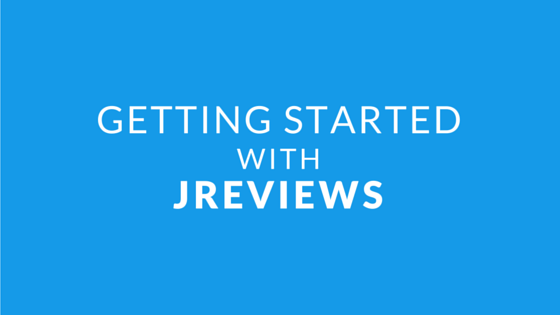 Once you get started with this, it will also be easier for you to begin to appreciate all of the possibilities offered by JReviews. It will also be easier for you to follow the next posts in this series.